Dash and Bash is a great new universal iOS game created by Touch.Play.Repeat. The game was released in May 2013. The game is a new and fresh twist on other traditional racing games. It’s got great artwork, and no shortage of features you can purchase. 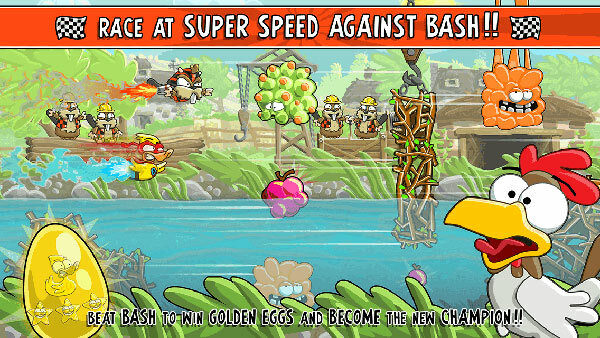 Dash and Bash is free, but you must pay $0.99 in order to unlock the cool features. There are unlock-able race modes and different levels for people of all ages, technical ability, and just overall skill at the game. The game is incredibly fun and addictive. And it’s great for when your standing in a line and are trying to avoid awkward situations. When else do you play games on your phone? It’s incredibly simple, and the controls are very easy to get used to. The art style used in the game is very unique and fun. Everything is in bright colors and is very funky looking and cute. The sounds used are great, and the music is too. All the fruits, characters, and backgrounds are all very animated. It’s just one of those games where the sounds, design, and music of the game isn’t annoying. Because almost everyone’s played a game with a great concept, but the other aspects of the game annoy the heck out of you. RACE through 5 chapters (25 race tracks) and meet friends and foe that will impact on your race time. Dash and Bash features 25 different race tracks (5 chapters), but you have to purchase the last four. But you don’t have to purchase them separately which is nice, it’s all only one in-app purchase for $0.99. All the different chapters feature different backgrounds too. All the locations have different themes (candy, spooky Halloween-ish theme, etc.). You can like them on their official Facebook page. In the game, you are trying to collect golden trophies. 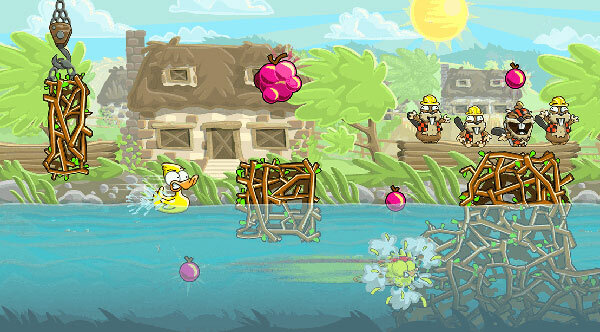 You either fly, swim, or dive to collect fruits and to avoid obstacles thrown in your way. You either race against the clock of you can race against Bash himself in an unlock-able mode. This is at a really high speed and typically only for the better players. Bash is the evil champion of the game, and if you beat him, you can become the new champion. Bash has “minions”, who will try to slow you down. Like in example, in the place of a fruit, sometimes there would be one of Bash’s minions. There are different minions who do different things. All the minions serve different purposes and do certain things to Dash. There is also gold you can get during gameplay, and this gold can be used to purchase things like outfits for Dash. There are multiple different outfits, and they all enhance some of Dash’s abilities and his appearance. Because who wants a boring yellow duck when you could have an awesome zombie duck? Personally, I think a zombie duck would be pretty cool. Once you’ve gotten three gold stars on a chapter, then you can race against Bash in VS BASH mode. If you beat him, you get a golden egg. 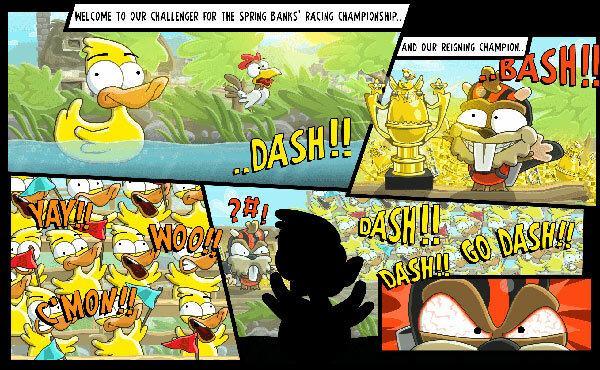 In order to beat a chapter and to get the chapter’s gold trophy, you have to earn five golden eggs, or you have to beat Bash on every track in the chapter. It’s fun and funny, and there’s multiple levels with many different characters and upgrades available. 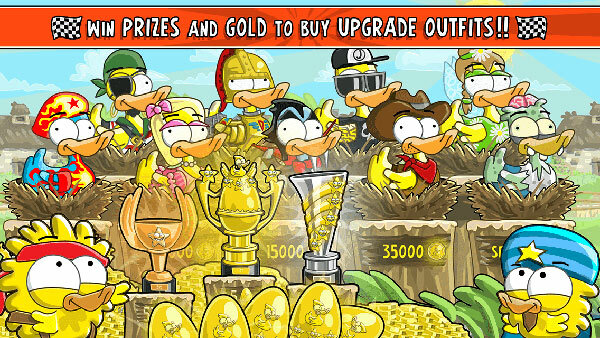 You can purchase Dash a wardrobe worthy of a champion duck (if there actually are any), and it’s overall just a great game. I would highly recommend Dash and Bash to anyone, and if you don’t like it, who cares! The game is FREE to TRY before you BUY. Its free to download and play the first chapter of the game and then just requires a single InApp Purchase ($0.99) to unlock all of the rest of the game’s chapters. It’s free, so why not give the first 5 levels a try?